No. Sorry, Marcel, but I’m not buying it. I don’t believe that it’s himself that the reader finds in a book; it’s not a mystical selfie. The best writing is a sort of tribal drum that calls us out of our isolation and into the firelight of the commonalities of humanity. Art helps us understand the suffering and hope that we share, not the machinations of the ego. Taking one hand from the wheel, he started to push back the sleeve of his jacket to see his watch, then stopped. He glanced over at her. She sat looking out her window through the rain, at the trees. She frowned and watched the trees, a dark wall and a dark road, a grim and rainy day. She did not look at him, or care about the time. It was only something to say, some excuse to conjure his voice out of the distance between them. It was a good voice, solid and deep, a comfort so often, and always in the dead of night. Sometimes she lay awake and whispered I love you, and he would answer in that voice, without waking. Love you too. 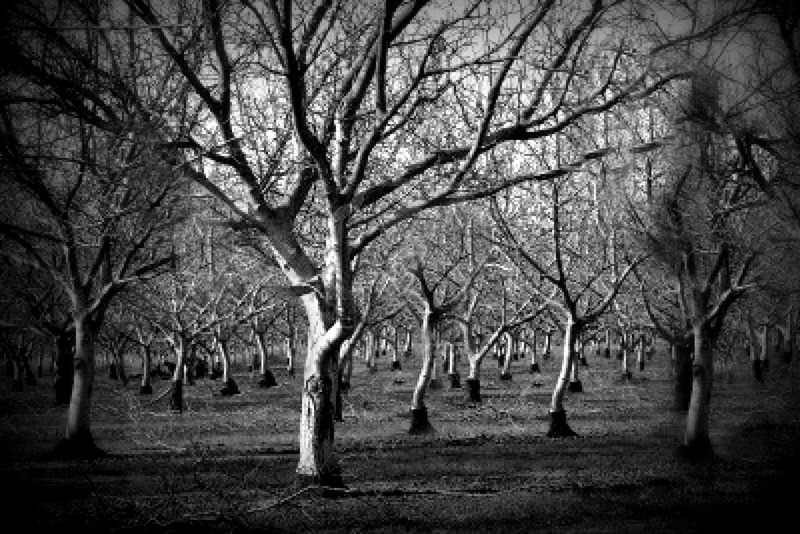 As they passed the end of the orchard, a field opened up. It was fallow, the earth broken and turned. Far back from the road was a brick house and a barn. The house was brightly lit, and smoke rose from the chimney. It was a stranger’s life sitting quietly surrounded by death, waiting to be swallowed by time and rain. She could not wait to get home, turn on lights and music, make tea, and pretend, like that house pretended, that the world was safe. They passed the end of a narrow road that broke the blur of idle land and disappeared toward the hills. She saw that her hands were resting on her lap palms up, waiting to be filled by something only God could design. There was another line of trees close against the road. Almonds, dark and full of rain. The sun rises slowly so that everything – the light, the birdsong, the smell of cooking food – is a long and tender hug. The musicians sleep until noon then sit about the plaza singing dirges as the day gets hot. He remembers his Papa would send him to the kitchen for a “glass of good cold water” on every summer day like this. Then he would take out his pocket knife, with a warning for it’s sharp little blade, and send the boy out to pick tomatoes for lunch in the amazing heat. He grew up with memories of water and fruit, but he still arrived at here and now, and there is no remedy for that. It has been a summer of strange dust and barking dogs, and the music in the streets is flat. The players strum and knock their guitars with heavy silver rings to keep the beat. They sound like horses walking on stones in the shade. The trees drink all night from somewhere deep beneath the town, and put on clusters of yellow blooms. Any breeze will blow the flowers down around the fountain, to be swept away. He works all morning, eats too much at noon and by evening he knows that he will never leave this place in all his life. He has an orange tree, clean shirts and a place to sleep in a room in a house that’s a cluster of rooms the use of which he has forgotten long ago. Except the ones for eating, bathing and sleep. All such things he does alone, and cuts many flowers for the dead. He has the music as the day goes by. His room is hollow, a hollow room in a hollow house. Like living in a musical instrument, a sounding box for playing the noise from the freeway and the breath of the night wind. He sits in it after the sudden slow day, drinking cold water, letting the night play every song it knows. Everything vibrates, trucks brake for merging traffic, and the sun comes up softly again in the dust. Life has few expectations, makes no demands, in a town this size. Just the little things, kind words and a gentle touch. So he made her breakfast the way she liked it, waited a moment and went out. Every day the same, and the summer ended and the oranges got ripe. The days got long again and he couldn’t keep her anymore. He offered her food and water with ice. He tried holding tight and letting go. Couldn’t think of a prayer except no and no. Which has never stopped the angels from their work. He wakes up late and finds the blanket kicked to a heap beside the bed. The sun on the shutters is already hot and the horses in the plaza drink from the fountain, stamp on the stones. Or the players knock their rings in the singing air. He sits naked on the bed and wishes it was night again and not so far from here to where she went. Not so much bright and hazy world to search. Maybe he’ll try the closet where she kept her pretty things, or part the air by the trees like a curtain in the heat. He could slice oranges and lemons with his Papa’s knife, leave them for the birds, for an offering of his solitude. Bittersweet. And a glass of good cold water. The signs out on the county road and on the side of his barn say Pony Rides, but they’re not really ponies. What you have here are donkeys. Most of the kids don’t know the difference. The grown-ups don’t care, so long as the kids are happy. So he can stand on the porch overlooking the barnyard, watching the sun glint off his old windmill, knowing the distinction is pertinent only to God. He is a man without pride, in the midst of humble beasts. Today he feels tired and sore, like the hot shower wasn’t enough to wake him up and warm his bones. The mug of coffee he grips in both hands is warming them, but as he drinks it in loud slurps, the rest of him aches for the sun to get up and get busy. The damned thing is dawdling in the tops of the cottonwoods, no help at all to a man with things to do. In the kitchen, he rinses his cup and sets it in the sink. He takes the teaspoon from the counter near the coffeemaker and drops it in the cup, so that it won’t slide down into the disposal and get beat all to hell. These little things matter now. His wife ordered their silverware years ago, from a catalog. Now that she is gone and he is old, he means the set to last the rest of his life. He will buy no more spoons or dishes, towels, sheets, doormats, wallpaper. He is finished with the replacement of things that have any hope of lasting; he buys nothing for the sake of something new. The radio on the shelf above his spice rack – salt and pepper, basil and thyme – says the day will be sunny with wind soft from the east. The radio was hers as well, redeemed from the Green Stamp Store, years and years ago. It’s held up better than any of their cars. Some things do. Out in the barn he follows his shadow as it falls ahead of him — cast by sunrise slanting through the big doors — down between the stalls where a dozen animals are awake and waiting. They’re hungry and he feeds them. He always wonders why they are happy with the same food every day. They’re happy to see him too, as he speaks to them, calls each one by name, and rubs their ears as they bend to eat. In the last two stalls are Sweetpea and Louie, a mare and her colt. Sweetpea has carried the children for years, turning in her circle slow and patient, with love for her burden. Laughter settles on her back like sunlight. But at night she dreams of a field. The grass is green and the man is not there. He needs to train Louie to walk in a circle steady and calm, to carry children carefully. These animals are bred for the work, but no one has ridden this colt yet. Louie is the only thing new on his place, the one concession to legacy and the years that roll on beyond the trees that border his land. He opens the gates to the paddock and corral, and lets the animals out of the barn to play in the sun and drink from their trough. He mucks their stalls, spreads fresh hay, and takes the long training lead out to tether the colt to the center pole. He fills again the cup he left waiting in the sink. He stands drinking his coffee, with cream and sugar, watching Louie test the limits of the rope. Then two men come walking through the gate and up the path from the road. He sets the cup on the porch rail and hurries down from the house, as they enter the corral and untie Louie from the post. Soon the sun is full and bright, and the man and his animals are warm in the spring air. Sweetpea takes some consolation in his petting of her long ears and stroking of her neck. “He’ll be back,” he tells her, and the old windmill shudders and turns in the breeze that was promised. Pony Rides by Kyle Kimberlin is licensed under a Creative Commons Attribution-NonCommercial-NoDerivs 3.0 Unported License.